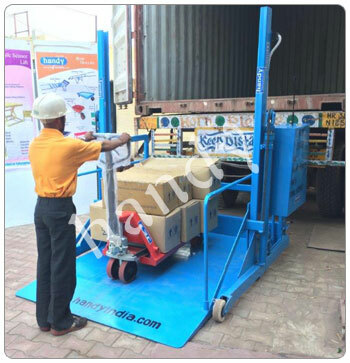 This “handy” Mobile Truck Loader is very useful machine to load, Unload the material, Paper reels , boxes, Drums, small machines , items on pallets, from the all type of trucks/ containers in plants , warehouses, Godowns etc. One person can easily handle this “handy” Truck loader as it is mobile on wheels and easily can be Pull Push on Good floors. The lifting of platform for loading unloading system is based on Electro/ Battery hydraulic system. One maintenance free Battery with high quality power pack is installed on the machine by which the platform can be UP and Down easily by simple Lever operation. This “handy” Truck loader is Easy to lift, easy to shift and easy to load the material in trucks . 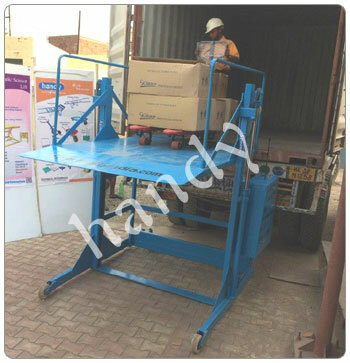 No need to fix a point for loading / unloading, anywhere in the premises material can be load unload With the help of “handy” truck loader.